For similarly named terms, see Taizong (disambiguation). Taichung (/ˌtaɪˈtʃʌŋ/; Mandarin Chinese: [tʰǎiʈʂʊ́ŋ]; Hokkien POJ: Tâi-tiong; Hakka PFS: Thòi-chûng, literally "middle of Taiwan"), officially known as Taichung City, is a special municipality located in central Taiwan. Taichung has a population of approximately 2.81 million people and is Taiwan's second most populous city, overtaking Kaohsiung in July 2017. It serves as the core of the Taichung–Changhua metropolitan area, which is the second largest metropolitan area in Taiwan. The current city was formed when Taichung County merged with the original provincial Taichung City to form the special municipality on 25 December 2010. Located in the Taichung Basin, the city was named under Japanese rule, and became a major economic and cultural hub. Originally composed of several scattered hamlets, the city of Taichung was planned and developed by the Japanese. It was called "the Kyoto of Formosa" in Japanese era because of its calm and beauty. The city is home to the National Museum of Natural Science, the National Taiwan Museum of Fine Arts, the National Taichung Theater, the National Library of Public Information, and the National Taiwan Symphony Orchestra, as well as many cultural sites, including the historic Taichung Park, the Lin Family Gardens, and many temples. The Atayal Taiwanese aborigines as well as several Taiwanese Plains Aboriginal tribes (including the Taokas, Papora, Pazeh, Hoanya and Babuza people) populated the plains that make up modern Taichung. They were originally hunter gatherers who later lived by cultivating millet and taro. In the 17th century, the Papora, Babuza, Pazeh, and Hoanya established the Kingdom of Middag, occupying the western part of present-day Taichung. In 1682, the Qing dynasty wrested control of western Taiwan from the Cheng family (Kingdom of Tungning). In 1684, Zhuluo County was established, encompassing the underdeveloped northern two-thirds of Taiwan. Modern-day Taichung traces its beginnings to a settlement named Toatun (Chinese: 大墩; pinyin: Dàdūn; Wade–Giles: Ta4-tun1; Pe̍h-ōe-jī: Toā-tun; literally: 'large mound') in 1705. To strengthen Qing control, a garrison was established in 1721 near the site of present-day Taichung Park by Lan Ting-chen. North of the city, on the Dajia River, an aboriginal revolt broke out in 1731 after Chinese officials moved in and compelled them to provide labor. The revolt spread through the city as far south as Changhua County in May 1732 before the rebels were chased into the mountains by Qing forces. In 1786, another rebellion against the Qing, known as the Lin Shuangwen rebellion, began as an attempt to overthrow the government and restore the Ming dynasty. Unfortunately, as the rebels moved northward, they turned to slaughter and looting. They were eventually defeated by a coalition of Qing forces, Hakka, Quanzhou Fujianese descendants, and aboriginal volunteers. When Taiwan Province was declared an independent province in 1887, the government intended to construct its capital city at the centrally located Toatun, which was also designated as the seat of Taiwan Prefecture. Thus the city took the title of "Taiwan-fu", meaning "capital city of Taiwan", from modern-day Tainan, which had held the title for more than 200 years. Qing official Liu Ming-chuan received permission to oversee development of the area, which included constructing a railway through the city. However, the provincial capital was ultimately moved to Taipei. After China lost the Sino-Japanese War in 1895, Taiwan was ceded to Japan by the Treaty of Shimonoseki, and the name of the city was changed to Taichū (Japanese: 臺中). The Japanese sought to develop the city to make it the first “modern” area of Taiwan and invested in roads, dams, and levees. In 1901, Taichū Chō (臺中廳) was established as one of twenty local administrative districts on the island. In 1904, the town of Taichū had a population of 6,423, and Taichū District had more than 207,000. Taichū Park was completed in 1903. A tower marking the old north gate was moved to the new park where it stands today. The first market in Taichū was built in 1908, along Jiguang Road between the Zhongzheng and Chenggong Roads and it is still in use today. The Japanese undertook a north-south island railway project. Taichū Train Station was completed and began operation in 1917, and still operates today. Taichū City was officially declared by Japanese Imperial authorities in 1920, and Taichū City Hall was completed in 1924 after eleven years of construction. Kōkan Airport (公館空港), now known as Taichung Airport, was constructed during Japanese rule. Taichū Middle School (now known as Taichung First Senior High School) was founded in 1915 by elite members of local gentry, including Lin Hsien-tang and his brother Lin Lieh-tang [zh], two wealthy Taiwanese intellectuals of the era. This was in an effort to teach children the culture of Taiwan and to foster the spirit of the Taiwanese localization movement. The Taiwanese Cultural Association, founded in 1921 in Taipei by Lin Hsien-tang, was moved to Taichū in 1927. Most of the members of this association were from Taichū and the surrounding area. The city became a center of Taiwanese culture and nationalism. From 1926 to 1945, Taichū Prefecture covered modern-day Taichung as well as Changhua County and Nantou County. At the end of the war, Japan handed over control of Taiwan. In 1947 the first Mayor of Taichung County (which included Taichung City) was Lai Tien Shen. The position was appointed by the government to rule during the interim period. Both Taichung areas were declared a provincial city and county in 1949. Since then the city has grown as a center of higher education, commerce, and culture, where 70% of employees worked in service industries. The surrounding county developed manufacturing, which employed 48% of the workforce, and focused so successfully on precision machinery, from machine tools to bicycles, that it was nicknamed the “Mechanical Kingdom.” On 25 December 2010, the city was merged with the surrounding Taichung County to create a special municipality of 2.65 million people spread across 2,214 km2 (855 sq mi). Taichung City is located in the Taichung Basin along the main western coastal plain that stretches along the west coast from northern Taiwan almost to the southern tip. The city borders Changhua County, Nantou County, Hualien County, Yilan County, Hsinchu County and Miaoli County. The Central Mountain Range lies just to the east of the city. Rolling hills run to the north leading to Miaoli County, while flat coastal plains dominate the landscape to the south leading to Changhua County and the Taiwan Strait to the west. Taichung has a warm humid subtropical climate (Köppen Cwa) bordering on a tropical monsoon climate, with an average annual temperature of 23.3 °C (73.9 °F). The highest temperature of the year occurs in July and August, while the lowest temperature occurs in January and February. Daytime temperatures remain warm to hot year-round, though night time temperatures during the winter months are significantly cooler than those during the summer and the warm daytime temperature. The average annual rainfall is just above 1,700 millimetres (67 in). The average humidity is 80%. Due to the protection provided by the Central Mountain Range to the east and the Miaoli hills to the north, Taichung is rarely severely affected by typhoons. However, occasional typhoons emerging from the South China Sea can pose a threat to the city as evidenced by Typhoon Wayne in 1986, which struck the west coast of Taiwan near Taichung. Due to Taichung plain's strong radiative cooling effect, Taichung City is one of the few cities of Taiwan where the year round average daily low temperature falls below 20 degrees Celsius, with even most cities of northern Taiwan, such as Taipei and Keelung having an average low of over 20.5 degrees C.
Taichung's population was estimated to be 2,778,182 in July 2017. There are slightly more females in the city (50.97%) than males. 24.32% of residents are children, while 16.63% are young people, 52.68% are middle-age, and 6.73% are elderly. According to Ministry of Interior statistics, the fertility rate in Taichung City in 2007 was 1.165 for each woman. The city surpassed Kaohsiung to become the second largest city in Taiwan in July 2017, growing at the 2nd fastest rate in Taiwan from 2012 to 2017. Recent population increases have been attributed to natural population growth, more people moving to the city, and subsidized housing. Unlike Taipei in the north, which is solidly in the Pan-Blue political camp, and the southern cities of Kaohsiung and Tainan that are solidly Pan-Green, Taichung is more balanced, with the urban city center area leaning Blue and the suburban and rural areas leaning Green. In fact, both major political parties have won a mayoral election among the last four with at least 49 percent of the vote (Democratic Progressive Party in 1997 and 2014 and the Kuomintang in 2001 and 2005). Similarly, the Kuomintang majority in the city council is not as large as it is in other cities, and is only negligible when one excludes Beitun District, which is solidly pro-Kuomintang. Taichung City's executive branch is headed by mayor Lu Shiow-yen of the Kuomintang. Taichung's legislative branch is a unicameral 46-member City Council. Each member is elected from one of six member districts where each voter has only one vote. Taichung consists of 28 districts and 1 mountain indigenous district. Inner Taichung refers to the eight former districts of Taichung City before the merger with Taichung County on December 25, 2010. Colors indicate statutory language status of Hakka language in the respective subdivisions. Note that Heping District is also an indigenous area of the Atayal people. Taichung is home to many industries. Taichung's Industrial Zone, located in Xitun District, is home to many factories, while nearby World Trade Center Taichung hosts many industrial conventions every year. Taichung is also home to the Central Taiwan Science Park, known for the many semiconductor factories located there, most notably TSMC. Taichung is also known for its bicycle manufacturing. Notable business located in Taichung include Giant Bicycles, SRAM, and TRP Brakes. Merida Bicycles is also located in nearby Dacun, Changhua. Taichung is most famous for its suncakes. Taichung's Chun Shui Tang teahouse (春水堂) is where bubble tea was invented. The recent surge in population resulted in the growth of the retail sector, with the opening of large department stores in Xitun District. Two railways run parallel to each other in Taichung: the Taichung Line, which passes through the urban areas in the interior, and the West Coast Line, which passes through rural areas closer to the shore. Taichung railway station is located in the heart of the city in Central District and numerous bus companies provide connections to other towns by bus. The THSR Taichung Station is located in Wuri and is served both by local trains as well as free shuttle buses into the city. Taichung Port, located on the coast in Taichung City, is the second largest cargo facility on the island capable of handling container shipping. Despite being the second largest port on the island of Taiwan, there are no passenger ferry services available and the port is closed to unauthorized personnel. Taichung City generally follows a radial road layout, with its center at Taichung railway station. Major roads start in Central District and run outwards, including Taiwan Boulevard, Xiangshang Road, Zhongqing Road, and Zhongshan Road. Freeway 1 runs along the Fazi River on the outskirts of the city, while Freeway 3 runs along the Dadu River to the coastal plains on the west, where it then runs parallel to the coastline. Freeway 4 begins in Qingshui District and terminates in Fengyuan District. Highway 74, known as the Taichung Ring Expressway circles the outskirts of the city, while Highway 63, known as the Zhongtou Expressway, runs from Taichung southward to Caotun, Nantou. Many other highways run through the city. Most road signs in the city have romanized spelling. 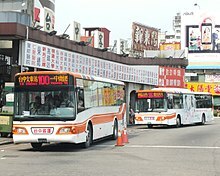 The most frequently used public transportation system in Taichung is by bus, with 18 bus companies providing 275 routes that cover all districts. All station names are announced in both Chinese and English, while some also providing Hokkien pronunciations. For passengers using a contactless smartcard (for example, an EasyCard), the first 10 kilometers are free. The city currently does not have any type of mass transit system, though a MRT system is currently under construction with completion of the Wuri-Beitun line scheduled for 2020. For a short period of time, the city operated a bus rapid transit system, named the BRT Blue Line, running down Taiwan Boulevard. It used articulated buses running a specialized lane, a first in Taiwan. The system began operation in July 2014; however, it did little to ameliorate traffic congestion, and was terminated within a year. The lane and specialized bus stops are currently used as a general bus lane, with bus lines 300-310 running through it. 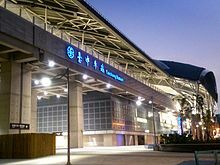 The Taichung International Airport is the third and newest international airport in Taiwan. It occupies the western corner of Ching Chuan Kang Air Base (CCK), and is about 20 kilometers (12 mi) from downtown Taichung City. The current airport replaced Shuinan Airport as Taichung's airport in 2004. Taichung City is in the process of implementing Hanyu Pinyin on road signs throughout the city. However, there are still signs displaying spellings from previously used romanization systems as well as Tongyong Pinyin and systems that do not conform to any standard system. Unlike Taipei, which uses a capital letter at the beginning of every syllable, Taichung City uses the standard form of Hanyu Pinyin on street signs erected in recent years. However, the municipal website uses the Taipei system. Most major intersections have at least one sign containing some form of romanization. Nearly every intersection in the downtown area has signs in Hanyu Pinyin. However, outside of the downtown area, while coverage by Hanyu Pinyin signs is improving, many intersections have signs in other romanization systems (especially Wade–Giles and MPS2) or no Romanized signs at all. The National Taiwan Museum of Fine Arts houses the world's largest collection of Taiwanese art. National Museum of Natural Science together with National Palace Museum in Taipei and the National Science and Technology Museum in Kaohsiung are called "the Museums of Taiwan". Across 22 acres (89,000 m2), the Museum is a six-venue complex housing the Space IMAX Theater, Science Center, Life Science Hall, Chinese Science Hall, Global Environment Hall and the Botanical Garden, excluding the Earthquake Museum in Wufong, which is dedicated to public education on seismology, located just 10 kilometers east of the main complex of NMNS. Over 30 permanent exhibit areas cover subjects on astronomy, space science, paleontology, ecology, gems and minerals, Taiwanese Aborigines, and tropical plants. Rotating special exhibits are a constant occurrence. 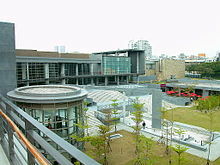 Taichung Municipal Cultural Center: The Municipal Cultural Center is located on Yingcai Road on property adjacent to the National Taiwan Museum of Fine Arts. Taichung Folklore Park: This park is dedicated to presenting a more traditional Taiwanese way of life. It includes a combination of authentic and recreated buildings and streets in an attempt to recreate a more rustic Taiwan. 921 Earthquake Museum of Taiwan: This museum is located in Wufeng District. With the rebuilding of Kwangfu Junior High on its present site, the Earthquake Memorial Museum was renamed the 921 Earthquake Museum of Taiwan on February 13, 2001. The new plan retains the original sites as a record of the damage wrought by the earthquake, and it also adds technological and educational facilities designed to inform the public and school children about earthquakes and disaster readiness. Asia University Museum of Modern Art (亞洲大學現代美術館) : This museum is located at Asia University in Wufeng District. On May 4, 2007, Dr. Tsai presented the project plan and officially invited Mr. Tadao Ando to design an art museum for Asia University. Therefore, the main purpose of inviting Tadao Ando to design the museum was to educate students and create the opportunity for them to have contact with art works from masters of international status. This museum provides various and amazing exhibitions which are related to Asian art and modern art. Temples can be found all over the city of Taichung. While many of them are of recent construction, others are considered historic and are indicative of the changing currents through Taichung's history. The Lin Family Temple in South District. Built during the Qing Dynasty. The Wen Chang Temple built during the Qing Dynasty. Fengjia Night Market - located adjacent to Feng Chia University. It has been considered as the best night market in Taiwan. Yizhong Street - located at North District, close to Taichung Park. One of the most popular night market in Taichung. Zhong Hua Night Market - located in the heart of Central District, along ZhongHua Road. Zhong Xiao Night Market - located south of the Taichung Railroad Station around the intersections of ZhongXiao, Taichung and GuoGuang roads. Donghai Night Market - located at the western side of Xitun, close to border with Longjing. A small street northwest of Tunghai University. Hanxi Night Market-A large night market which is located Hanxi East Road Section 1 at East District. Taichung has a famous hot spring, Guguan, located in Heping District. Taichung has one mosque called the Taichung Mosque. Built in 1951, the mosque is Taiwan's 4th mosque and it is located in Nantun District. Zhongshan Hall: Zhongshan Hall is a popular venue for a variety of performances including musical, opera, ballet, dance, theatrical, and other performances. Seating capacity is 1,692. The Taichung Jazz Festival takes place annually through the month of October. It features a variety of acts at numerous venues throughout the city. The Sinon Bulls were a professional baseball team playing in the four-team Chinese Professional Baseball League. While they were identified with Taichung City, many of their “home games” were played outside of the city due to the inadequacies of the old Taichung Baseball Field. The team was expected to move into the newly completed Taichung Intercontinental Baseball Stadium in 2008, but never did. At the end of the 2012 season, Sinon Corporation announced its intention to sell the team. By late December, an agreement was reached between Sinon Corporation and E-United Group, and the team was renamed EDA Rhinos and moved to Kaohsiung. The Special Force II division of the Flash Wolves esports team is known as the Taichung Flash Wolves, the team competed in the Special Force II Pro League (SF2PL) based in Taipei. Taichung hosts two road races annually. The ING Marathon preparation 10K race is held every September in the Metropolitan Park. The Supau Cup Marathon is held on the city's streets every autumn, either in October or November. Taichung has signed sister city agreements with nineteen cities in nine countries since 1965. They are listed below along with the dates that the agreements were signed. ^ Former North Shore City merged with Auckland on November 1, 2010. ^ 《中華民國統計資訊網》縣市重要統計指標查詢系統網 (in Chinese). Retrieved 11 June 2016. ^ "Demographia World Urban Areas PDF (April 2016)" (PDF). Demographia. Retrieved 11 June 2016. ^ 各區人口結構 [Population structure by district]. demographics.taichung.gov.tw (in Chinese). Retrieved 2019-04-10. ^ "Demographia World Urban Areas PDF (March 2018)" (PDF). Demographia. Retrieved 2018-09-09. ^ "Taichung's City Bird: Little Egret". Archived from the original on 2006-09-13. Retrieved 2006-09-29. ^ "Taichung's City Flower: Christmas Kalanchoe". Archived from the original on 2006-09-13. Retrieved 2006-09-29. ^ "Taichung's City Tree: Palimara Alstonia". Archived from the original on 2006-09-13. Retrieved 2006-09-29. ^ 民國106年7月戶口統計資料分析. Ministry of the Interior, ROC. 2017-08-04. ^ "台中人口超越高雄 躍升第2大城 - 政治 - 自由時報電子報". news.ltn.com.tw. Retrieved 2019-01-07. ^ Taichung History Map Walk, publish by Center for Digital Cultures，Academia Sinica，2017，p.23. ISBN 9789860546279. ^ a b c d e f "From Aboriginal Homeland to Modern City: A Look at Taichung's Rich History". Archived from the original on 2014-12-04. Retrieved 2014-11-30. ^ Roy (2003), p. 27. ^ Roy (2003), p. 22. ^ Gardella (1999), p. 164. ^ Davidson (1903), p. 245: "...the seat of government (which had been formerly at the old town of Taiwan-fu in the south, which city had been in turn the capital of the Dutch, Koxinga, and the Chinese,) was now removed temporarily to the new city of Taipeh, which had been lately in course of construction ... In connection with this, it is necessary to go further and explain that it was the intention of the government to build a new capital city in the centre of the island near Changwha. Accordingly, the new city was laid out and the construction of official yamens commenced. The name of the new city became Taiwan-fu, or the capital city of Taiwan (Formosa), and it was also to be the seat of a new prefecture called Taiwan [Prefecture]." ^ Davidson (1903), pp. 247-8:"To obtain Imperial sanction to the undertaking, Governor Liu represented to the authorities that, if the capital was removed into the interior as they had recommended, it would be necessary, as there were no roads, to construct a railway from the new capital to one of the coast ports, preferably Kelung in the north. This proposition met with sonic opposition in Peking, but eventually Imperial approbation was obtained." ^ Roy (2003), p. 36. ^ Takekoshi (1907), pp. 199-200. ^ "Taichung Geography". Archived from the original on 2006-02-20. Retrieved 2006-09-29. ^ , relatively low compared to other major cities of Taiwan. "Districts & Landmarks". Archived from the original on 2006-02-20. Retrieved 2006-09-29. ^ Joint Typhoon Warning Center. "Typhoon Wayne (12W)" (PDF). Archived from the original (PDF) on 2011-05-06. Retrieved 2007-05-04. ^ "Taichung's Population". Archived from the original on 2006-09-13. Retrieved 2006-09-26. ^ Juvina Lai (2017-08-02). "Taichung, the second largest city in Taiwan". Taiwan News. Retrieved 2017-08-12. ^ "How housing policy helped Taichung top Kaohsiung". Taiwan News. 2017-08-03. Retrieved 2017-08-12. ^ R.O.C. Central Election Commission. "R.O.C. 1997 County/City Magistrate/Mayoral election results". Archived from the original on 2007-09-28. Retrieved 2006-10-14. ^ "台灣積體電路製造股份有限公司". www.tsmc.com. Retrieved 2018-11-20. ^ "系統訊息". www.giantcyclingworld.com. Retrieved 2018-11-20. ^ "SRAM Opens Asia Development Center". Bike Europe. Retrieved 2018-11-20. ^ "Let's Go On a Backpacking! – The Must-buy Taichung Local Specialties". Tra News. Retrieved 2010-07-11. ^ 台式茶文化登陸──春水堂. Taiwan Panorama. December 2006. Retrieved 2010-07-11. ^ 聯合新聞網. "台中捷運綠線 林佳龍：預計2020通車 | 聯合新聞網". 聯合新聞網. Retrieved 2018-11-20. ^ "Romanization of Taichung's top 50 Main Roads". Archived from the original on 2006-02-06. Retrieved 2006-09-29. ^ Chiu, Lisa (1998). "ABOUT TOWN: Hitting the Night Markets". Compass Magazine. 5 (5). Taichung, Taiwan. Retrieved 2007-10-10. ^ "Taiwan to hold Special Force 2 Pro League video game tourney". FOCUS TAIWAN. March 25, 2015. Retrieved October 22, 2015. ^ "Taichung City Diplomacy". Archived from the original on 2007-07-01. Retrieved 2006-09-29. Davidson, James W. (1903). "Chapter XVII: Progressive Formosa: A Province of China. 1886-1894". The Island of Formosa, Past and Present : history, people, resources, and commercial prospects : tea, camphor, sugar, gold, coal, sulphur, economical plants, and other productions. London and New York: Macmillan. OL 6931635M. Gardella, Robert (1999). "From Treaty Ports to Provincial Status, 1860-1894". In Rubinstein, Murry A. (ed.). Taiwan: A New History. New York: M.E. Sharpe. ISBN 9781563248160. Phillips, Steven (1999). "Between Assimilation and Independence: Taiwanese Political Aspirations Under Chinese Nationalist Rule, 1945-1948". In Rubinstein, Murry A. (ed.). Taiwan: A New History. New York: M.E. Sharpe. ISBN 9781563248160. Roy, Denny (2003). Taiwan: A Political History. Ithaca: Cornell University Press. ISBN 9780801488054.